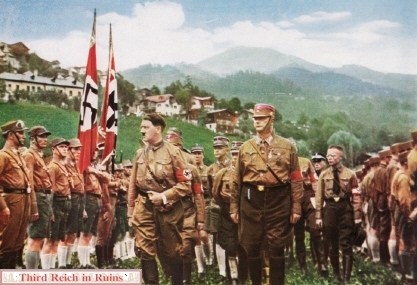 Adolf Hitler was introduced to the Obersalzberg, a mountain retreat area above the town of Berchtesgaden in the Bavarian Alps, in April 1923. 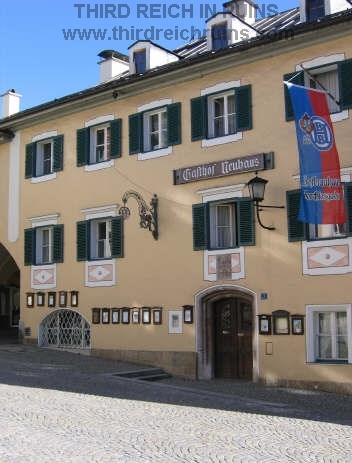 In 1925 Hitler stayed in a small cottage on the Obersalzberg upon his release from Landsberg prison, following the failed Munich putsch of 9 November 1923. 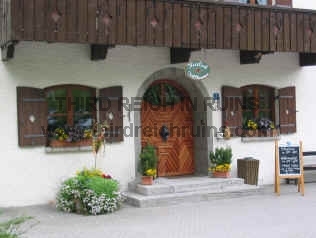 In this cottage, later called the "Kampfhäusl," Hitler worked to complete the second part of his book Mein Kampf. 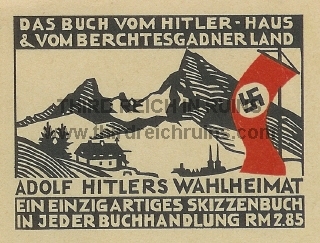 In 1927 (or 1928) he rented and later bought a small mountain house called Haus Wachenfeld. 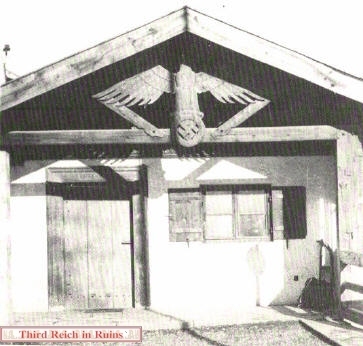 This house became the basis for a later expansion that turned the peaceful, out-of-the-way Obersalzberg retreat into a huge complex of Nazi buildings, mostly closed to the public. 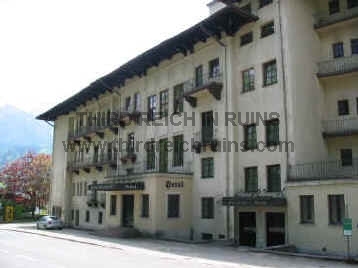 Nazi leaders such as Hermann Göring and Albert Speer had houses in this complex, to be close to their Führer, but the mastermind of the Obersalzberg complex was Nazi Reichsleiter and Party Secretary Martin Bormann (who also had a house there, overlooking Hitlers). 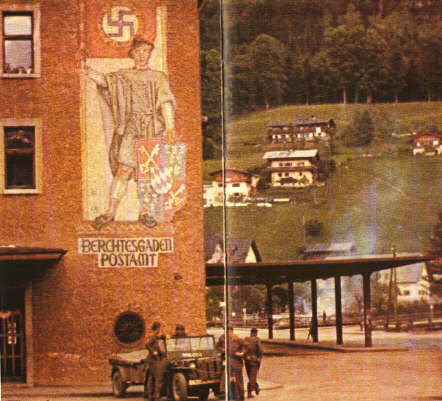 Bormanns construction programs leveled most of the privately-owned retreat houses and mountain farms, substituting administration buildings, SS guard barracks, a huge greenhouse to supply Hitlers vegetarian tastes, an experimental farm, a rebuilt hotel for visiting dignitaries, and housing complexes for the workers needed to serve all of this. 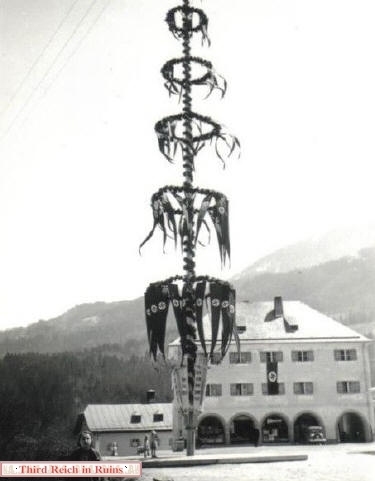 Perhaps Bormanns most lavish achievement was the Kehlsteinhaus ("Eagles Nest"), built on a mountain spur almost 3000 feet higher than the Obersalzberg and reached by a road with only one hair-pin curve, which was an engineering feat of the day. 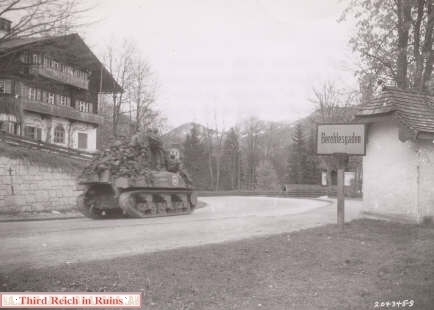 Because the Allies feared in 1945 that Hitler would leave Berlin and set up an "Alpine Redoubt" to continue the war from the mountains, the Royal Air Force bombed the Obersalzberg complex on 25 April 1945. Many of the buildings were substantially destroyed, and looting by local residents, then by the Allied occupation troops tended to complete the job. 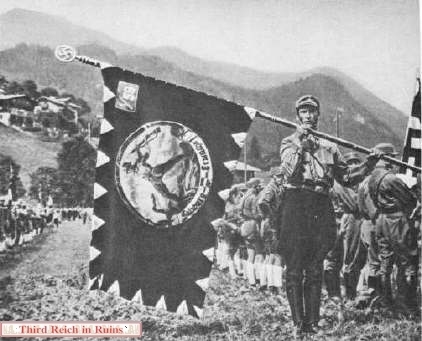 One of the conditions for the return of the Obersalzberg to German control in 1952 was the destruction of the remaining ruins. 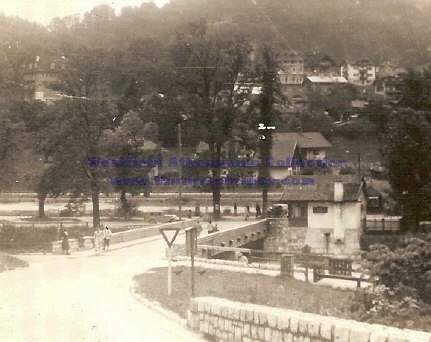 Accordingly, the ruins of Hitlers Berghof, Bormanns and Görings houses, the SS barracks complex, and other associated buildings were blown up and bulldozed away. 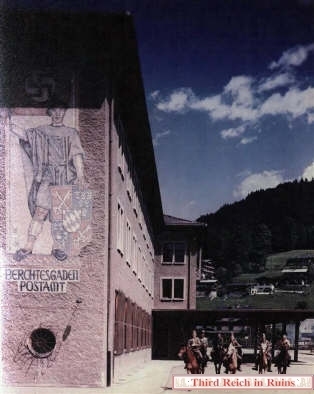 The Kehlsteinhaus was saved, because it had not been bombed (although it was on the target list, it was apparently too small to spot and hit) and the Bavarian government recognized its tourism potential. 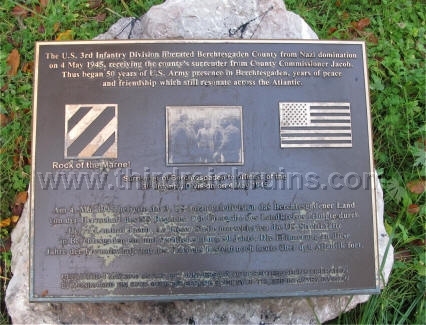 However, the U.S. Army had appropriated several of the less damaged and intact buildings for use as soldier recreation facilities, and these were maintained until 1995 by the American Forces Recreation Center (AFRC). The key building was the remodeled Platterhof, renamed the General Walker Hotel. 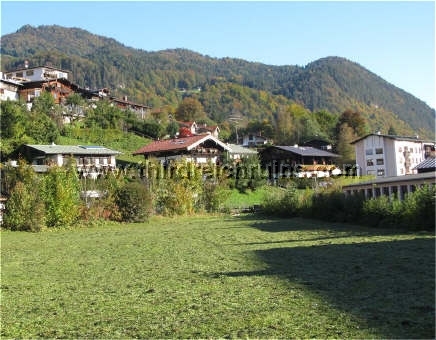 The Gutshof (estate farm) was turned into a sports lodge and golf course, and several hotels in Berchtesgaden itself were reserved for American soldiers. 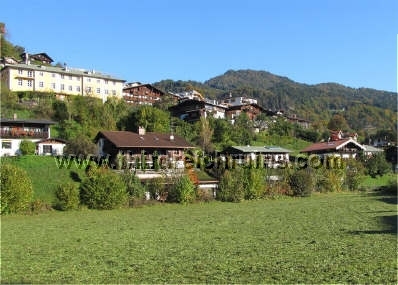 The Obersalzberg building ruins that had not been destroyed were left substantially as they remained after the 1951-52 destruction, and guided tours were available to these and the underground tunnel and bunker complex at the General Walker Hotel. 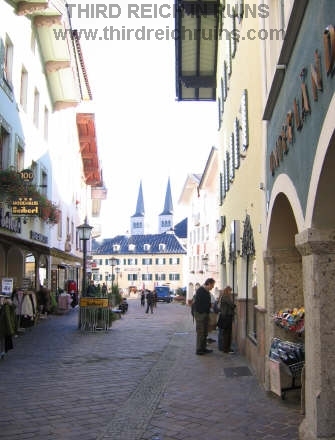 Since the return to German control in 1995, the fate of the remaining Obersalzberg buildings and ruins has been problematic. 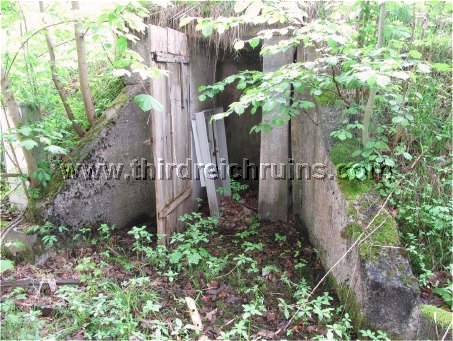 The garage to Hitler's Berghof, which escaped the 1952 destruction, was removed shortly after the turnover (or at least broken up, and the remains buried); however, parts of the Berghof still remain (as shown below). 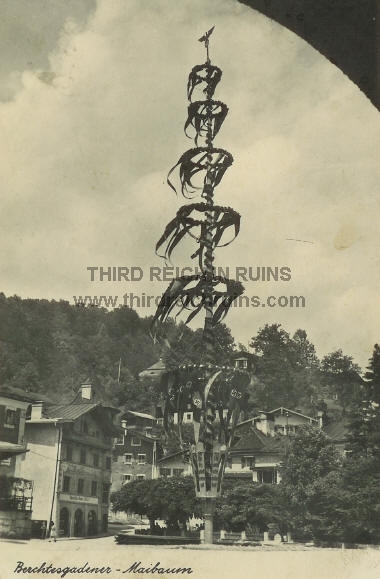 The Platterhof / Gen. Walker Hotel was razed in late 2000 - only a side building remains. 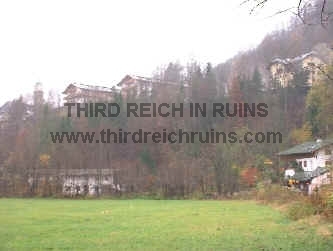 In 2001-2002 the remains of the SS Kaserne and adjacent buildings were torn out of the ground, and a luxury hotel was built near the site of Göring's and Bormann's houses. 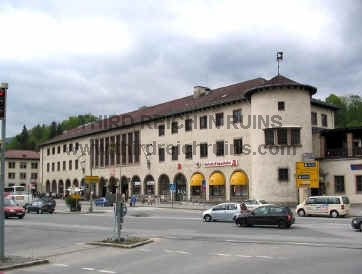 The Berchtesgadener Hof hotel was torn down in 2006, and the ruins of the Mooslahnerkopf Teehaus were also removed in 2006. 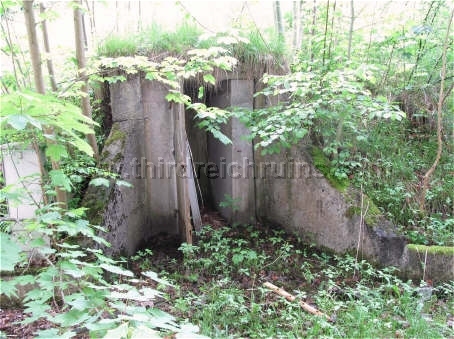 In 2016 the ruins of the Lenzerfeld Bee House were demolished. Apparently further destruction of the historic buildings and sites will continue in the future. 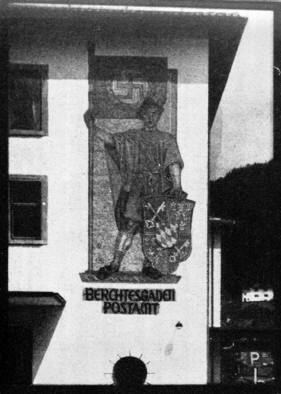 However, in late 1999 the Bavarian government opened a Documentation Center in the rebuilt Gästehaus Hoher Göll, with displays on the Obersalzberg under the Third Reich and the Holocaust. 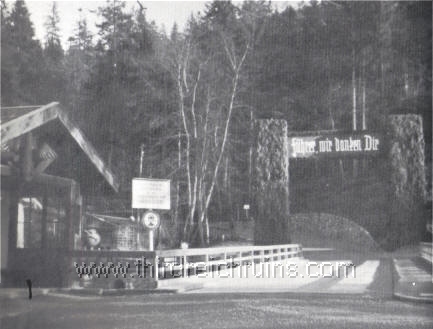 Entrance to the Documentation Center includes entrance to the Platterhof tunnel complex. In 2018 an enlargement to the Documentation Center is being built. The government has proudly reported the increasing visitor numbers each year. 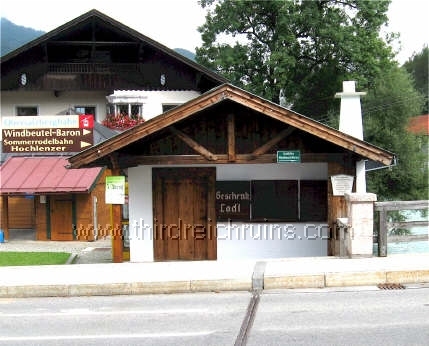 Bus tours to the Kehlsteinhaus (several daily from May-October) are full during nice weather, and another popular stop is the Hotel zum Türken, where a different part of the tunnel complex can be toured. 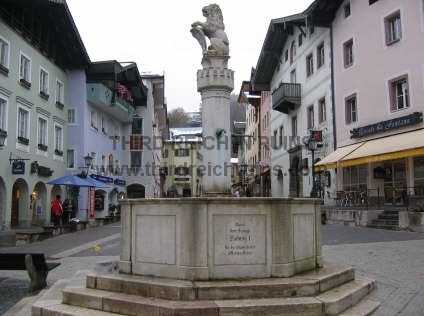 History minded tourists will continue to visit the Obersalzberg because of what happened there from 1933-1945, regardless of the further destruction of the area sites. The history happened - it cannot be erased by removing the remains. Click here to browse a listing of changes in the area over recent years. 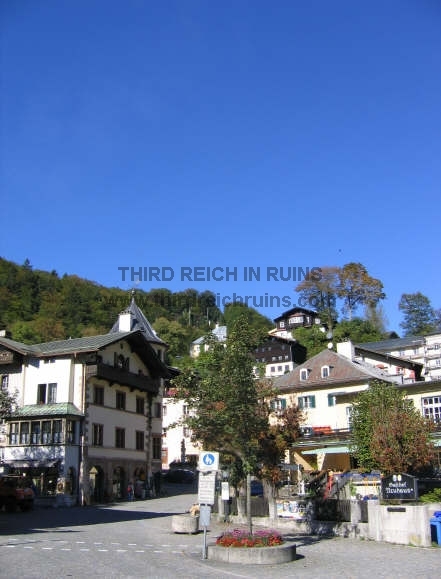 My new guide book to Third Reich sites in the Berchtesgaden and Obersalzberg area has been published by Fonthill Media. 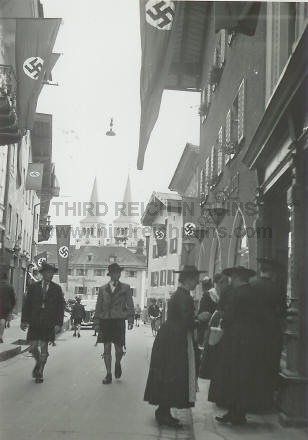 "Hitler's Berchtesgaden" is available now at Amazon and other retailers ( the Kindle version is also available from Amazon). 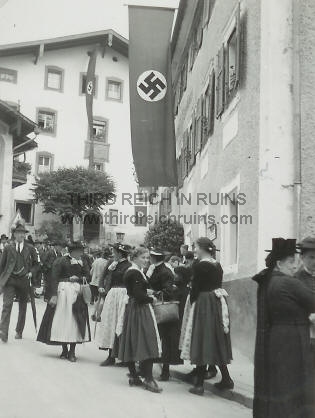 Photos without credit are from postcards and publications available in Berchtesgaden; in most cases these have been published without sources given and without copyright notice. Modern photos are the page authors, and may not be reproduced without permission. Refer to the bibliography for a listing of these and other sources. 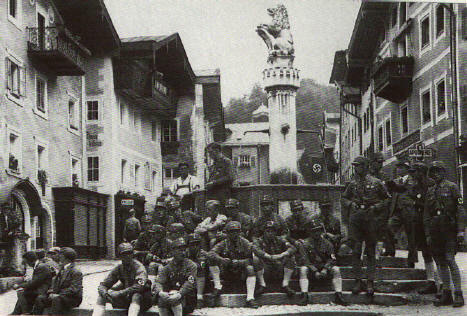 Members of the SA (Sturmabteilung) gather at the fountain in the main square in Berchtesgaden in the 1930s. 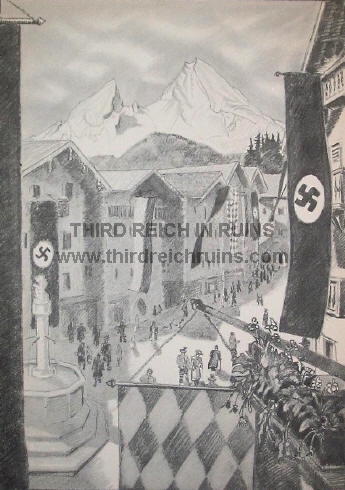 Karl Schuster-Winkelhof, son of the owner of the Hotel Zum Türken on the Obersalzberg, sketched the Berchtesgaden town square with the Watzmann mountain as a backdrop, in his rare book of art sketches that provide a glimpse of life on the Obersalzberg in the early days of the Nazi settlement there. 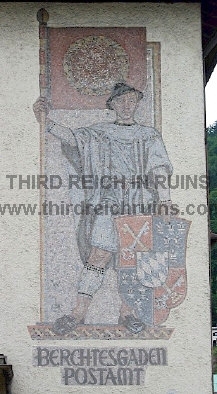 This view was from a window of the Gasthof Neuhaus. 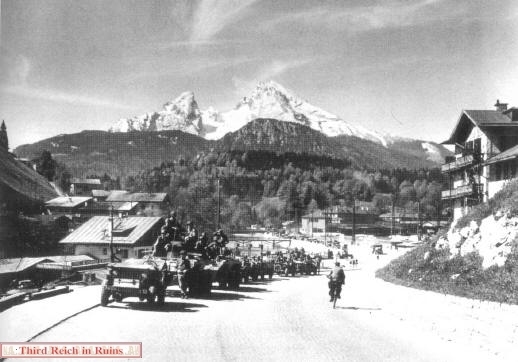 Jumping forward in time to May 1945, the following photos show the American advance and occupation of Berchtesgaden at the end of World War II. 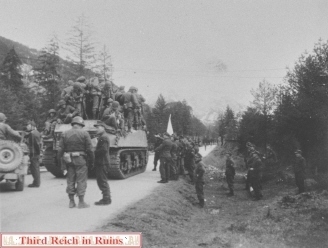 and the Obersalzberg, for other photos from May 1945. 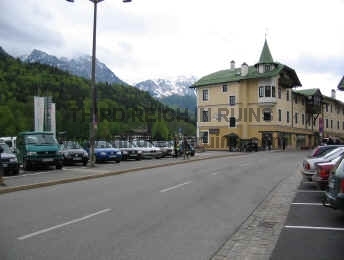 The Berchtesgaden Bahnhof (train station) was built from 1937-1940. 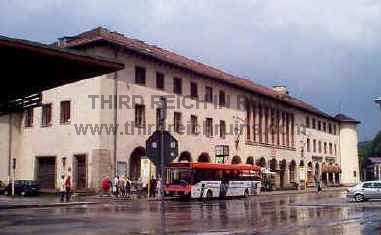 Designed in massive Third Reich style (to impress visitors), the building had a special reception area reserved for Hitler and his guests (seen on the right above - around the corner from the circular tower in the left-hand photo). 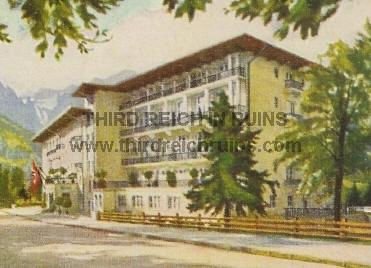 Note - The Bahnhof was bought by a private purchaser in 2015, and the building has been remodeled, with bowling alleys and meeting rooms added, and a "Bavarian Pub" in Hitler's former reception area. 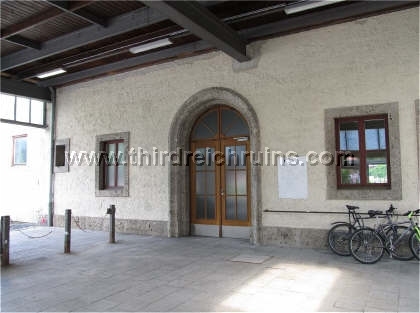 Hitler used the doorway on the left to travel to and from his special train, into his personal reception area of the Bahnhof. 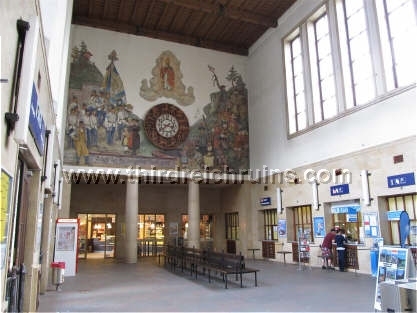 The main public area is seen on the right, complete with massive columns, high windows, and Berchtesgaden-themed murals (these were painted in the 1950s, but they may have replaced similar Third Reich era works). 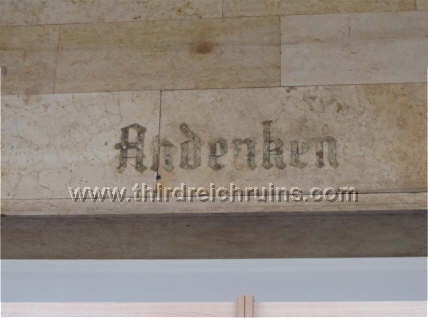 Recent remodeling revealed where metal letters had originally been mounted as signs for "Zeitungen" (newspapers) and "Andenken" (souvenirs). 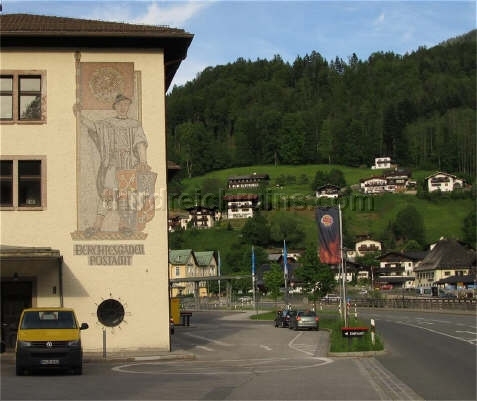 Other such signs were for "Handgepäck" (hand luggage to check), "Gepäck Expreßgut" (shipped baggage), "Zigarren" (cigars), "Feinkost" (food, snacks). 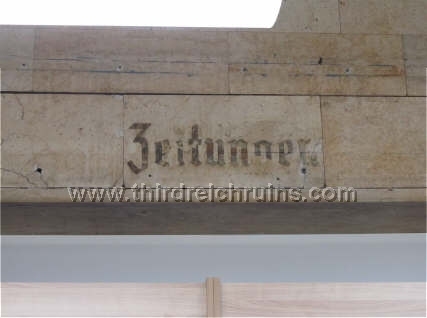 The sign for "Zu den Zügen" (to the trains) still remains above the rear exit. 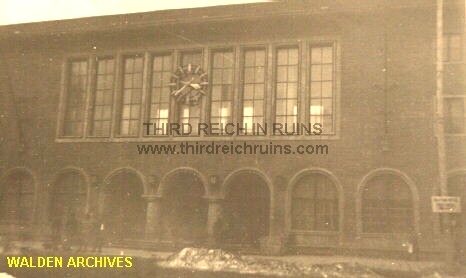 The Hauptbahnhof as my father saw it in 1946. 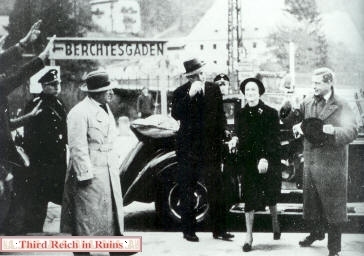 The Duke and Duchess of Windsor (ex- King Edward VIII and his wife the former Wallis Simpson) visited Adolf Hitler at the Berghof on 22 October 1937. 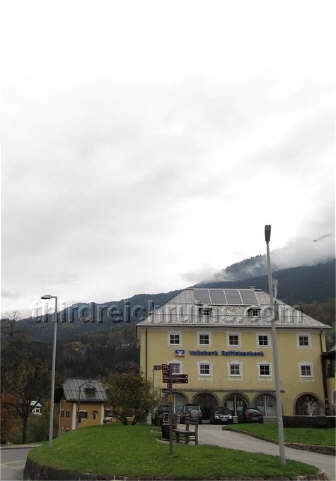 Here, they are seen in front of the Berchtesgaden Hauptbahnhof, on their way home. 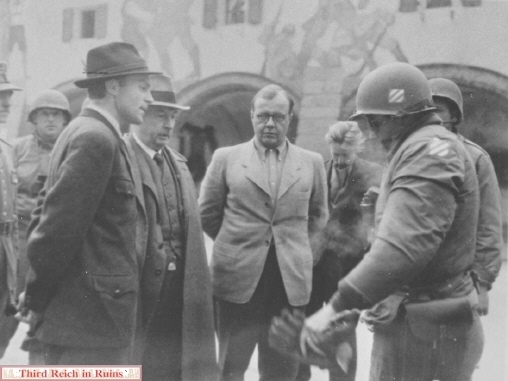 At the left is Robert Ley, head of the German Labor Front, with Hitler's interpreter Paul Schmidt in the center. The large building in the background of both views is the Kurdirektion (Tourist Info Center). 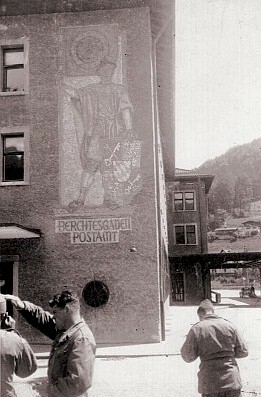 Göring's art collection was stored in several places - in this and another nearby train, in the tunnels beneath his house on the Obersalzberg, and in a tunnel beneath the Luftwaffe headquarters in Berchtesgaden. 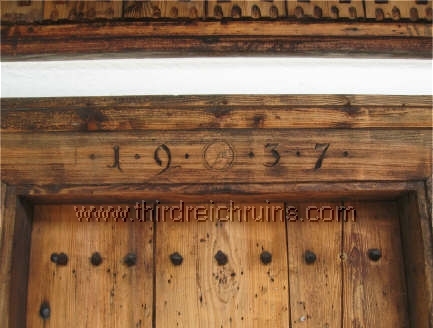 This photo shows the 1937 date carved in the wood above the doorway. 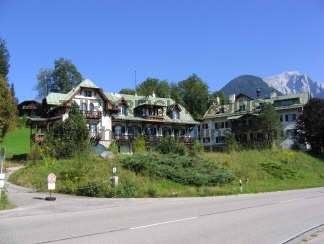 The Berchtesgadener Hof hotel had previously been the "Grand Hotel Auguste Victoria," popular with visiting royalty. 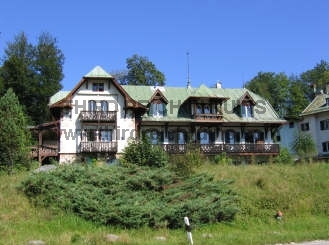 The Nazis bought it in 1936, remodeled it and renamed it the Berchtesgadener Hof, and used it to house dignitaries visiting Hitler's Berghof, such as the Duke and Duchess of Windsor, British Prime Minister Neville Chamberlain, and David Lloyd George. 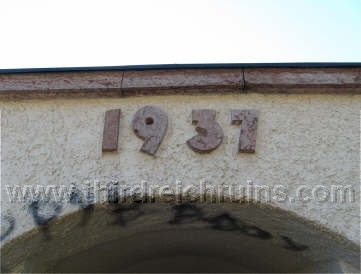 High-ranking Nazis such as Josef Goebbels, Heinrich Himmler, and Joachim von Ribbentrop also stayed here, as did visiting military officers such as Erwin Rommel. 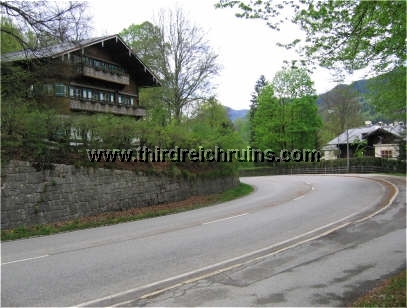 Eva Braun lived at the Berchtesgadener Hof when she first came to Berchtesgaden, before moving into the Berghof. 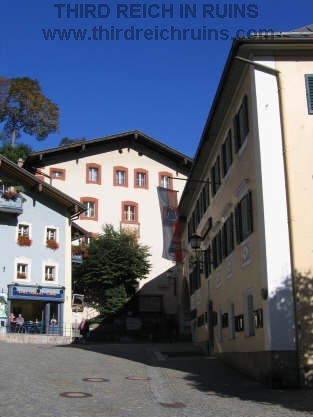 Later, Obersalzberg functionaries such as Bormann's brother Albert lived here, as did Hitler's sister Paula (incognito, as Paula Wolf). 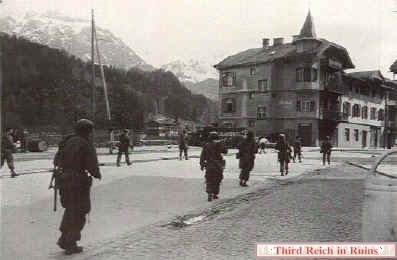 After the U.S. Army occupied the area in May 1945, the Berchtesgadener Hof was the scene of several high-ranking surrenders, including that of Field Marshal Albert Kesselring. 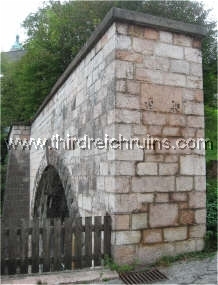 Click here to visit a subpage with several more photos of the Berchtesgadener Hof, including the 2006 destruction. 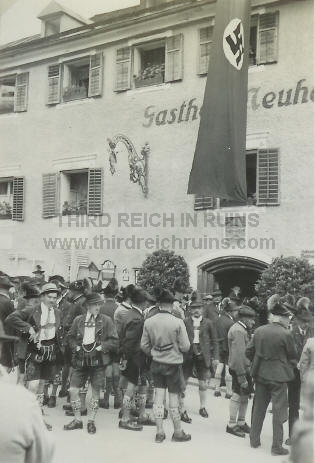 Another local hotel with Third Reich connections was the Hotel Geiger, located up the street from the Berchtesgadener Hof. 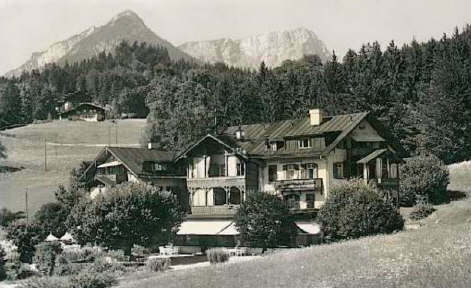 The hotel was used as a rest and recreation center for Luftwaffe officers during the war, and as area headquarters for Luftwaffe Gen. Karl Koller in May 1945. 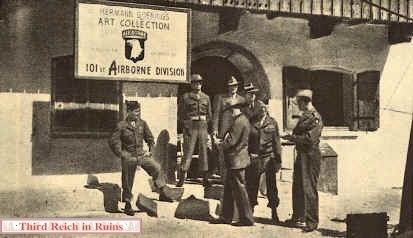 It briefly served as regimental headquarters for the 506th Parachute Infantry Regiment of the U.S. 101st Airborne Division after the taking of Berchtesgaden in May 1945, and was also used as a U.S. Army facility for a period after the war, but has now stood vacant for several years. The interior still has several period rustic paintings of mountain scenes, such as those on the bar seen here. 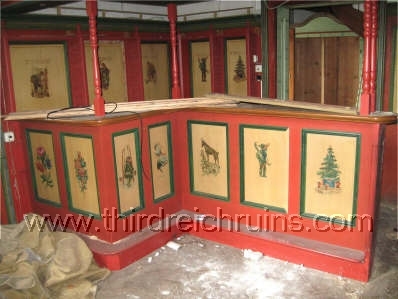 Over years of abandonment and neglect, most of the interior decorations (including those shown here) were plundered. 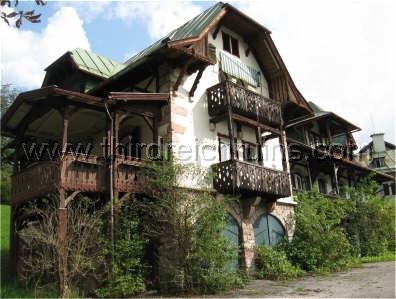 Demolition began on the ruined and plundered Hotel Geiger in January 2018. It was announced in February that even the historic part (shown here), which was under Monument Protection, will be torn down as well. 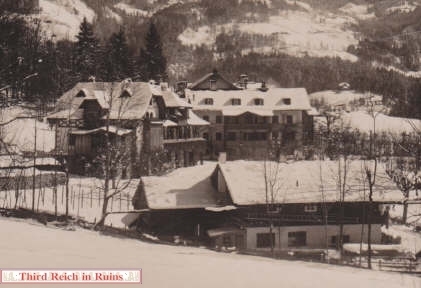 As a Luftwaffe military facility, the Hotel Geiger had a tunnel system for air attack protection built into the hillside behind it. 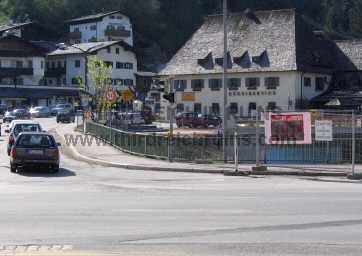 In 1988 the tunnels were filled in and the entrances were blocked. Paula was Adolf Hitler's only full sibling who lived to adulthood. 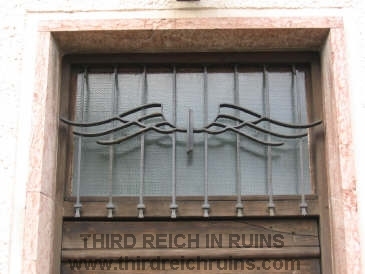 During much of the Third Reich period she lived incognito by her brother's desire, as Paula Wolf. 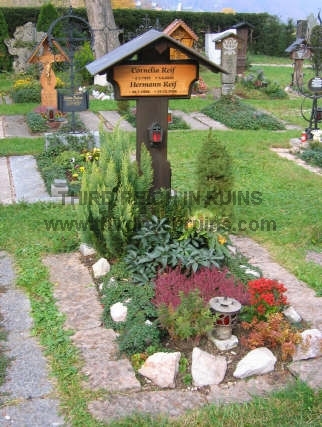 After the war she lived quietly in Berchtesgaden, where she died in 1960 and was buried in the Bergfriedhof cemetery. 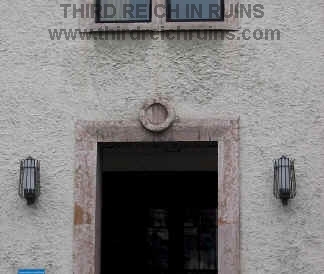 Also to be found in the Bergfriedhof cemetery are cenotaphs to Fritz Todt, Nazi Armaments Minister, and Gen. Rudolf Schmundt, Hitler's Army Adjutant. 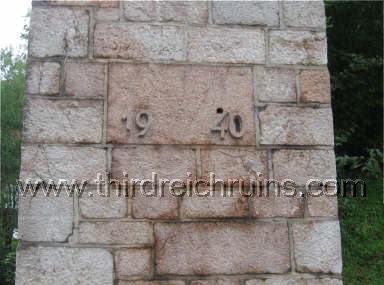 Early Nazi publicist Dietrich Eckart and Kanzlei chief Hans Lammers are buried in the Altfriedhof cemetery in downtown Berchtesgaden. 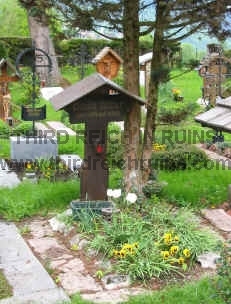 Note - Paula Hitler's grave plot is also used by another family, and when other burials are made in the plot, her grave marker may be temporarily removed or covered over. 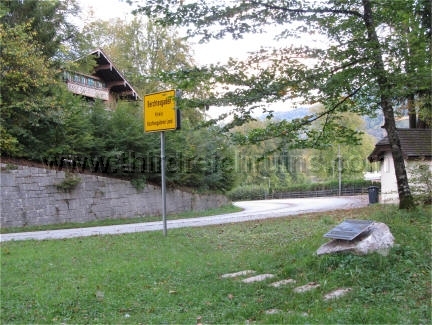 As of October 2007, Paula Hitler's name on her marker has been covered over by a plaque bearing the names of the couple who owned this plot and were buried there in 2005 and 2006. 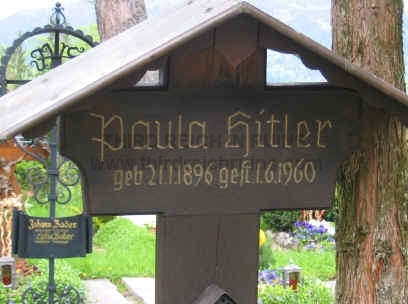 According to local information, Paula Hitler is still buried there even though her name is not visible on the grave marker. 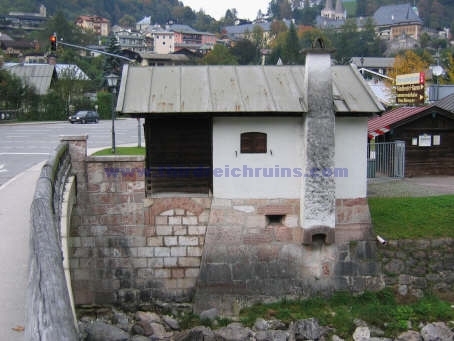 Click here to see some air-raid shelter tunnels and bunkers in Berchtesgaden. 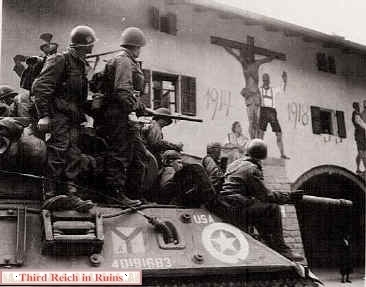 Click here to visit a page about the capture of German Gen. Tolsdorf by the 101st Airborne Div., near Hirschbichl, Austria. 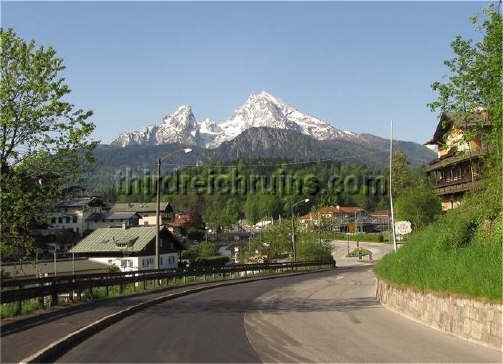 Click here to visit a page with large-scale photos and panoramic views of sites in Berchtesgaden and the Obersalzberg. For further information, including Internet links, check the Bibliography page. 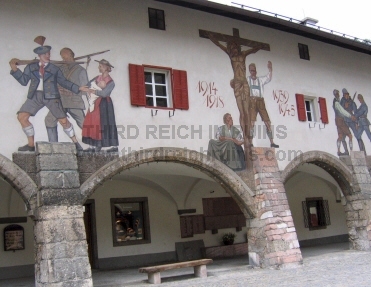 I wish to express my sincere appreciation here to the following individuals, who have supplied significant information and/or photographs for use on my Berchtesgaden/Obersalzberg pages: Florian Beierl, Mark Eve, John Figgins, George Foehringer, Ralf Hornberger, Randall Lee Rose, Frau Ingrid Scharfenberg, Jacqueline Wilson. 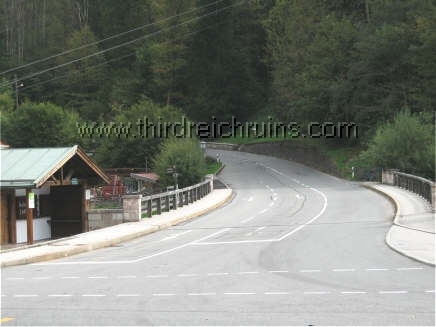 My guide book to Third Reich sites in the Berchtesgaden and Obersalzberg area has been published by Fonthill Media. 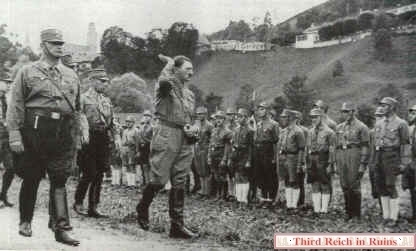 "Hitler's Berchtesgaden" is available at Amazon and other retailers ( the Kindle version is also available from Amazon). this website, or any consequence(s) of such use(s). of any other website, linked to this page or otherwise.